Fascinating story of rescue on Dateline. An accident leaves a vehicle dangling over the edge of a bridge with a family trapped inside. Ultimate cribbing challenge? Call it blind luck, fate, divine intervention, or providence, but sometimes you just happen to have the exact tool you need to solve a muddling problem. The other episode “Suspicion” is interesting too. A couple accused of murder. A good lesson: Most murdered people aren’t done in by strangers, it’s usually somebody you know. In this post, I’m going to write a bit about my opinion of knives as defensive weapons. If you’re squeamish, don’t read this. Don’t worry, you’ll probably never need to know this stuff anyway! 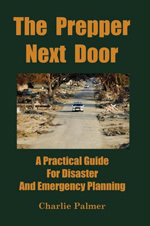 I recently read two great prepper books each with a heavy focus on self defense. The first: Prepper’s Home Defense by Jim Cobb. The second: The Modern Survival Manual by Fernando “Ferfal” Aguirre. I highly recommend both books. Each author has a different view of knives as defensive weapons. Cobb says if you’re forced to defend yourself with a knife, that’s really bad. You messed up. You should have had a gun. Fernando says up close knives rock as defensive weapons, even being superior to pistols. Both points of view are valid. It’s like the debate about the 45 ACP versus the 9×19 mm. What I’m writing here is only my opinion. Let’s back up a bit and talk about swords, in particular, Japanese Samurai swords. In World War II many Japanese pilots carried them. Why? Was it because they were effective at that point in history? No. It was because it tied into the warrior ethos. Carrying swords helped these pilots feel like warriors. To many, swords have a certain romance. The same is true of knives to a lesser extent. Why else replace a Ka-Bar with an expensive Randall or a Loveless? Borrowing from Cobb, if you’re on a modern battlefield with only a knife or a Samurai sword, something has gone horribly, horribly wrong. The enemy soldier with a rifle will shoot you. If you watch the video of an emotional hijacking, you’ll see what a person who is amped up looks like. Put a knife in the hands of somebody in this state who wants to kill and they’ll stab their victim until they run out of energy, just like a boxer who punches himself out. This is why victims of violent stabbings are stabbed twenty, thirty, or forty times. While some try to learn knife fighting “techniques,” I think the reality is that the advantage goes to the craziest, most insane, mentally-defective, enraged psychotic in the fight. This person will keep coming and stabbing regardless. They’ll close the distance to be in range. Their state will make them senseless to pain. This is very different from the psychology of staying “cool headed” so you can aim a rifle and fire effectively. If you’re somehow able to keep your wits about you while channeling your inner Jodi Arias, here’s what you need to remember: Knives kill by blood loss. That’s all. Your best targets are anywhere large blood vessels are reachable. Put your hand on your breastbone, right between your breasts. Push in. It will feel pretty hard. If a knife hits bone or rib, it might or might not penetrate depending on your strength. It might glance off the bone and penetrate. Move your hand upward and you’ll no longer feel bone or cartilage. You’ll feel a soft indentation at the base of the throat. This is the ideal target for a knife attack. Don’t push too hard! If you feel gently, you might feel your pulse. The neck is the main highway of life, carrying blood up to the brain and back and carrying oxygen to the lungs. Knife attacks to the neck are highly effective, because there isn’t protective bone. In a strange mix of the macabre and mathematics, some combat books compile a list of the vulnerable knife points and how long a bad cut to each would cause a person to lose consciousness. In practice, I don’t think it matters: The advantage goes to the wackiest, most hostile nut job. All he knows is that he wants to put the knife in you, again and again and again. How do you defend yourself from a nut job with a knife who is bound and determined to kill you? Can’t you just use a basic Aikido technique to disarm the attacker? Unfortunately, no. These stylized Aikido techniques look impressive, but frequently fail in the real world. Here’s a good example: A person has a knife in the “ice pick” grip and they raise their hand up to stab you. There’s no reason an attacker would do this, unless they want to film a remake of Psycho, but bare with the example. One Aikido technique is to grab their wrist with your left hand. Step in. Reach around behind their arm with your right hand. Grab your own wrist and step behind them. Push their hand backward. They’ll fall to the ground as you control the arm. Bystanders will applaud your heroics. When your attacker is cooperating, it looks feasible. Many things can go wrong though. If the attacker has their wrist turned down, you’d be grabbing knife blade. If he pulls back, you’d get cut badly on your hand. If you manage to grab his wrist, it’s likely he’ll do one of the most natural things to get out of this: turn his arm downward and in toward him. It will turn against your thumb, bringing the knife in contact with your arm (Remember he has an ice pick grip. If you put a knife in hand normally, you’ll instantly see you don’t want to turn your hand this way). And, we haven’t even mentioned he’s trying to claw out your eyes with his other hand. Let’s assume you get this far. Next, you move your face frighteningly close to the knife and push down in that direction. What could possibly go wrong? I’m not saying this technique can’t work. But there are a lot of variables, things to go wrong, even if you’ve spent many hours learning the technique. This example teaches the knife wielder an important thing: A smart defender will want to control or attack the knife arm. If you’re the one with the knife, protect your knife hand! Don’t make the exaggerated off-balance moves you see Aikido partners making. Once unleashed, immediately retract the knife hand to safety. A few more observations: There are personal variables. How much reach do you have? How strong is your grip? How long is the knife? All of these factors can effect the outcome. Some things that can work for one person won’t work for another. If you have large and powerful hands, you’ll have a huge advantage in controlling the attacker’s knife arm. Don’t believe all that matters is technique. There are books written about knife fighting and disarming. Some of them are 100% BS. Others are only about 50% BS. If knife fighting was ever an “art,” it is dead. Nobody today has extensive experience in fighting other trained people with knives. There are crazy people who have attacked innocent people on multiple occasions. There are convicts and prison guards who have witnessed multiple knife attacks. There are many people who have been in one or two confrontations, often against untrained, inebriated people. There are bouncers in bad bars who have dealt with untrained, drunken patrons who pull out knives. There are people who “practice” with magic markers. Becoming a magic marker warrior won’t assure you’ll respond the same when you’re being cut. There isn’t a “UFC” for knife fighting. Fortunately, people aren’t that twisted. Careers would be short. Some people can’t have guns for defense and others worry they might someday be forced to confront a knife wielding attacker. This is largely the market for these knife fighting books. One book is Bloody Iron by Harold Jenks and Michael Brown (Desert Publications 1978). This book is as good as any I’ve seen. The authors write: “there is just no way to become proficient at any of these things without some realistic practice.” I agree with this completely. The book has some good advice about protecting your knife hand. But even this book has a great deal of stuff that won’t work for most people, which you can confirm yourself by digging out some magic markers. It talks about “quickly” twisting the body to avoid a stab. Many of us can’t move that fast, even if we manage to read where the knife is going. The reality: If you get into a knife fight with a crazy who really wants to hurt you, it’s likely going to be ugly. Many factors that would influence the outcome of a regular fight will have a strong say: How fast are you? How strong? How much reach do you have? Is the attacker somehow impaired? Maybe, you’ll quickly disarm the attacker. Maybe, you’ll lose a portion of your stomach. Bloody Iron has some good advice about attacking your opponent’s knife arm. If you’re confronted by somebody who has a few operational brain cells, he’ll be afraid of getting cut. He won’t really want to get that close to you. If you keep moving and stay just out of range, he might try to stab or slash while you’re still out of reach. You can then attempt to follow the advice in the book and attack the knife arm with your knife. The target is the inside of the wrist. This is contingent on having the speed and being able to move rapidly. If you’re older: Forget about it: Carry a 38. Up close, will you be able to employ your gun against a knife wielding attacker? Maybe. Will you get cut? Yes. But if you’re up against someone who is younger, stronger, faster, who has more endurance, a gun is probably your best bet. How Do You Train For This Situation? Besides the common-sense self-defense stuff I wrote in my book, how do you prepare for a knife attack? I’m not a big fan of having preppers prepare for long-shot possibilities. There just isn’t enough time in your life to cover all the scenarios. But if you anticipate facing a deranged person with a knife, who not only wants to threaten you, but to kill you: If you’re younger and smaller, run sprints. There is no honor in confronting an armed attacker with your bare hands. If you’re a larger guy who can’t run, work on strengthening your grip strength. You might only get one chance to grab and hold the attacker’s knife hand. If you’re going to try to defend yourself with a handgun, practice point blank point shooting. In a recent Youtube video I linked to (taken down due to copyright issues), the TV Show Top Shot had shooters doing old-school trick shooting. Some of the stuff they did echoed a middle-aged painter who decided to take up trick shooting as a hobby. His name was Ed McGivern. He wrote a book on the topic: Fast & Fancy Revolver Shooting. One of the things McGivern worked on was tossing something up in front of him and shooting it in the air. The tendency is to raise your arm to point at your target, but try to keep it back and low as you progress. If you can blow a clay bird out of the air up close with your pistol while keeping your hand back and low, you’ll be ready for anything up close. You can start with large sheets of paper at six feet to get a sense of where your bullets are going and progress to stationary tin cans. Large coffee cans make a good beginning aerial target. Given today’s ammo costs and that many preppers lack a place to practice this kind of shooting: Look into the modern laser training devices. Most shooters don’t practice this type of shooting, but it can save your life. By the way, the PrepperWebsite is a great resource for those looking to find new prepper websites. No matter what your prepping interest, you’ll find some good stuff over there. For those looking for unique outdoor survival skills to work on, this article talks about using a water transpiration bag. A water what bag? For those who want to learn more about the process of transpiration, this page has some great information. Before clicking the link, here’s a quick question: How many gallons of water can a large oak tree “transpire” over a year? For aspiring mountain climbers, this is a nice blog. I coming to believe God wants us to admire high mountains from the ground!